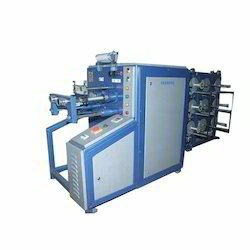 We are the leading manufacturer & supplies of bobbin winding machine. This range is offered by us in variegated specifications, so as to meet the diverse client requirements. Based on modern technology and best quality raw materials, this range offers excellent quality and performance. Clients can avail this range from us at most competitive prices. We are pioneer in manufacturing Bobbin Winder. Heavy Duty Torqque Motor in Each Spindle Winding Speed 150 To 200 Mtr./Minute. Package Size : 250 mm Traverse ×300 mm Dia Line Speed Control by main Dimmer & Individual By fine Control.Segment in 12 Spindle, 15 Spindle & 18 Spindle etc. A lot of yarn is left on bobbins after weaving and kneading process and thus gets wasted. To prevent this we use this winder with unwinder makes use of any leftover yarn which in turn reduces the cost of the product. Engineered to perfection this automatic winder with unwinder efficiently utilizes the residual yarn. Keeping in mind ever-evolving requirements of our respected clients, we are offering a premium quality Automatic Bobbin Winder. Note: We are renowned Exporters for Automatic Bobbin Winder. We, JVM Enterprises leading manufacturers and Exporters of Bobbin Winder suitable for Monofilament Plant. - Auto offer oil system is added, uniform filling for the thread , not easy to offer the thread , more uniform pattern , more three-dimensional sense. - Mouth sheet added installation inputting knife makes thread inputting automatically after thread shape installed.